A post-holiday slowdown – not to mention wintry grey skies – diverts many visitors to places other than the Pacific Northwest. Those who do venture to our corner of the world at this time of year, however, benefit by having a lot more room to roam, and a chance to spot interesting features that might be hidden by the rush of tourist feet at the height of summer. Take Pike Place Market. No need to string family members together lest you lose one another. 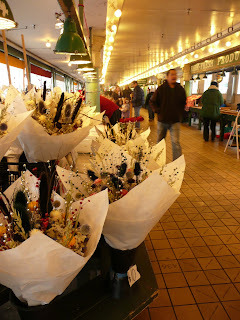 You can wander the aisles freely and spot your spouse several stalls away. You can even read the names engraved on every floor tile – thank these folks for donating money in the 1980s to replace the floor that was crumbling away. ng a variety of local watering holes of the caffeinated kind, samples included, of course.